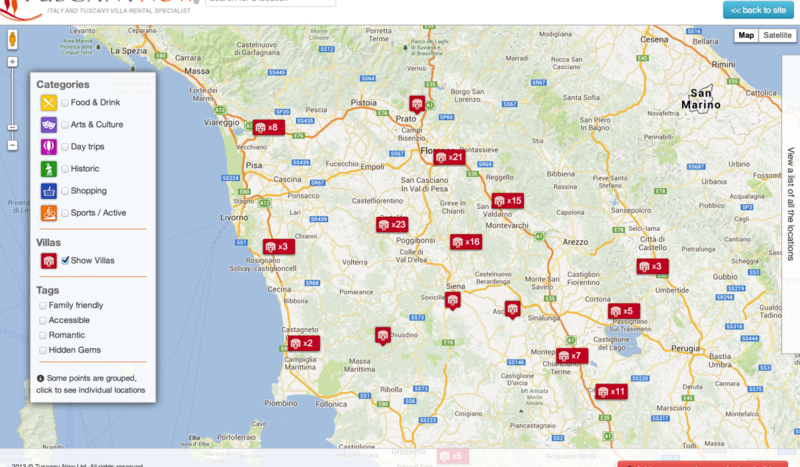 Working with the SEO agency Propellernet I built a full page interactive map for the travel company Tuscany Now. This map displays the locations of the companies villas as well as a wide range of user submitted locations and points of interest. The map had several aims, first was to drive interest through social media and blogs and secondly to improve the listings on the travel companies website by providing users with more details on what was nearby the holiday locations. The map was built using the Google Maps API and RequireJS. On page load it pulls the categories, tags and locations from an api and populates the map. Whenever the user interacts with the map the url updates to reflect the current position, zoom level or selected location, this allows people to share what they are looking at with other people. The new point feature is a separate layer which loads on top of the main map, this collects the necessary information and allows the user to tag the point with their email address, Twitter or Facebook account. When the point has been manually approved it will appear on the map.